The Fun Fair will be held on the grounds of Maranatha Baptist Church, which is located at 5790 Flemings Lake Rd., Clarkston. This street is at the light where the Secretary of State is located. We are 1/4 mile west of Sashabaw just north of 1-75. The Fun Fair features inflatables, old-fashioned games, good food, crafts, prizes, and lots of fun in a family-friendly atmosphere.... and best of all, the Fun Fair is completely free, so leave your wallet at home! 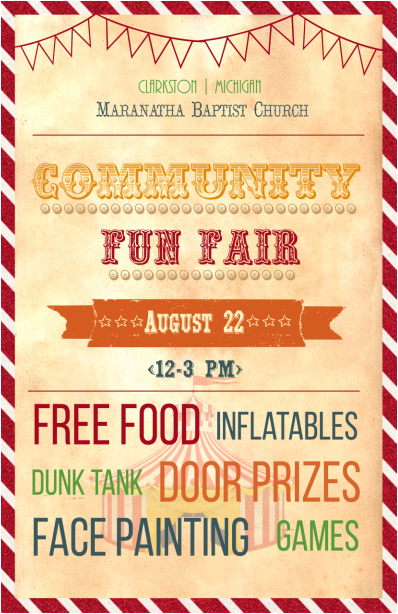 We'd love to have you and your family join us on August 22, noon to 3 PM at the Fun Fair! Pre-register below to be entered into an additional door prize drawing! Pre-register by filling out the form below!